St Paul's Cathedral The Cathedral dedicated to St Paul has overlooked the City of London since 604 AD, a constant reminder to this great commercial centre of the importance of the spiritual side of life. The current Cathedral - the fourth to occupy this site - was designed by the court architect Sir Christopher Wren and built between 1675 and 1710 after its predecessor was destroyed in the Great Fire of London. 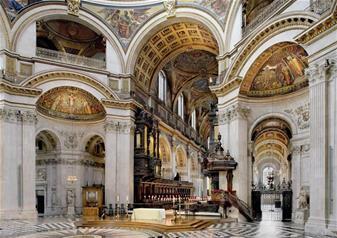 Its architectural and artistic importance reflect the determination of the five monarchs who oversaw its building that London's leading church should be as beautiful and imposing as their private palaces. 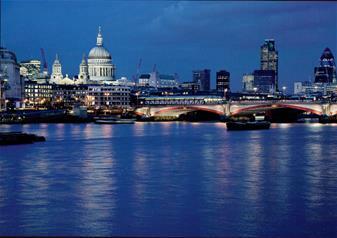 Dominating the London skyline, the magnificent domed cathedral, designed by Sir Christopher Wren, was completed in 1710. 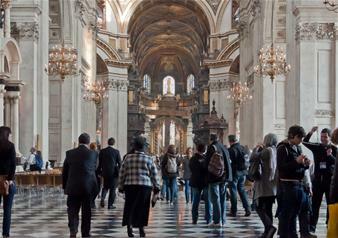 Visitors can now enjoy a new inclusive multimedia guide which weaves together contemporary photography, archive film footage (including the wedding of HRH Prince Charles & Lady Diana Spencer) and the voices of those who work in St Paul’s today, with interviews and commentary from the Dean of St Paul’s, the Conservator and Director of Music amongst others. The Golden Gallery The Golden Gallery is the smallest of the galleries, which runs around the highest point of the outer dome, 280ft (85.4 metres) and 530 steps from ground-level. While the dome and galleries were being built, Wren was hauled up and down in a basket at least once a week to inspect the work in progress. 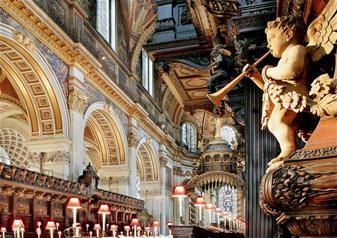 He was 76 by the time this work was completed in 1708 and he watched as his son placed the last stone in position. The Dome St Paul's is built in the shape of a cross, with the dome crowning the intersection of the arms. It is one of the largest Cathedral domes in the world, 111.3 metres high. It weighs approximately 65,000 tonnes and is supported by eight pillars. Between the arches of the inner dome are mosaics of prophets and saints, which were installed between 1864 and 1888. The murals in the dome were created between 1715 and 1719 by court painter Sir James Thornhill and feature scenes from the life of St Paul. The Stone Gallery The Stone Gallery is one of the two galleries above the Whispering Gallery that encircle the outside of the dome. The Stone Gallery stands at 173 ft (53.4 metres) from ground-level. It is reached by 378 steps. While the Dome and galleries were being built, Wren was hauled up and down in a basket at least once a week to inspect the work in progress. He was 76 by the time this work was completed in 1708 and he watched as his son placed the last stone in position. The Whispering Gallery The Whispering Gallery runs around the interior of the Dome and is 259 steps up from ground-level. It gets its name from a charming quirk in its construction, which makes a whisper against its walls audible on the opposite side. Those travelling in a group can benefit from the Group Tour System where the tour leader can communicate clearly to the group via a microphone and transmitter to each of the group member’s receivers. Filming and photography is not allowed inside the Cathedral, but is permitted on the external galleries, without tripods, on a non-commercial basis. Children under six (6) years of age are admitted free of charge and do not require a ticket. (Children must be accompanied by an adult when visiting the galleries) Family tickets are available online allowing entry for 2 adults and 2 children of 6-16 years of age. If you require a family ticket you need only select one (1) ticket here. All advance tickets are available with a self-print option only. You will need access to a printer to print your admission tickets. 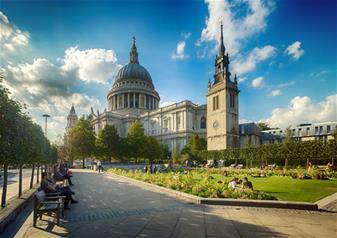 St Paul’s Cathedral offers complimentary entry for a visitor with a disability and an accompanying carer or necessary companion – these tickets should be requested on arrival. 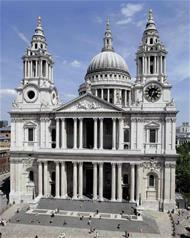 Venue Information: St Paul's Cathedral, St Paul's Churchyard, London EC4M 8AD Nearest Train Station: Blackfriars, Cannon Street or London Bridge Nearest Underground: Blackfriars Public Bus Routes: 4, 11, 15, 23, 25, 26, 100, 242 Golden Tours act as an official agent for these activities, as such you are subject to the terms and conditions of the supplier. Warner Bros. Studio Tour London - The Making of Harry Potter (from King’s Cross St Pancras).